Elsa groaned lightly, shifting as she slowly opened her eyes. Her eyes adjusted as she glanced around, realizing she was in a prison cell. She sat up, letting the blanket covering her slip off as she looked to the one source of light coming from the window. Seeing the wintry landscape outside, she became more alert, attempting to run to the window when she felt something tug her back, grunting as she noticed that her hands were locked into metal coverings attached to chains. She looked down at them, stepping over the chains to lean back, craning her neck to get a better look outside the window; everything was covered in snow, the fjord was completely frozen over, locking any docked ships into place. "No… what have I done…?" Elsa whispered to herself. A moment later, she heard the prison door opening behind her, gasping lightly as she turned to see who was approaching. Hans entered, holding a lantern. He had a cautious air to him, placing the lantern down as he closed the door. "Why did you bring me here?" She asked with a stern tone. "I couldn't just let them kill you…" Hans replied, rubbing his arms from the cold, and his breath was visible. "But I'm a danger to Arendelle… get Anna!" Elsa demanded. "Anna… has not returned…" Hans replied, and dread came over Elsa's face, turning to glance back out the window. "If you would just stop the winter… bring back summer… please…" He pleaded. Elsa closed her eyes for a few moments, turning back to look at him. "Don't you see…? I can't…" Her voice shook, her brows furrowing deeply. "You have to tell them to let me go!" Hans sighed lightly, frowning as he nodded. "I will do what I can." He gave her a nod before turning, leaving her in the prison cell alone… or so she thought. Elsa looked down at her hand coverings, ice beginning to form over them. She breathed a bit heavier, biting her lip as she lingered. Out of the shadows, just behind her, Pitch stepped forth. "Are you really going to leave your life in his hands when you can simply use your own?" Pitch asked. Elsa whirled around, gasping fearfully at Pitch's sudden appearance. "H- How did you…" She whispered, her chains jingling as she tried to back away from him, going as far as they allowed. She looked around frantically, unable to even defend herself. "There is no need to be afraid of me, Elsa. I have no intention of harming you." Pitch said, holding his hands up. "You know… I met someone much like yourself once… so lost, wondering why he was gifted with the powers he-"
"Gifted? You think this is a gift?" Elsa asked him midsentence, holding up her hands inside the metal coverings. "This is a curse! I… I have done nothing but burden my family, hurt my sister, my people!" "Oh, but it is a gift, Elsa. And once you eliminate your fear, you will see that." Pitch replied. "How?! I've tried to control it all my life!" Elsa cried. "You've tried to control your power… but that is not what hinders you, Elsa, it is your fear you must control. You've hidden away in the shadows all your life… I know what that's like. Not having a family to be close to… everyone thinking you're nothing but a monster… I have been where you are Elsa, and to much of an extent I still am. But I am no longer a victim to it as you are. You can stand up to any and all opponents who dare challenge your authority, but first, you must stand up to your fear!" Pitch exclaimed. Suddenly, Elsa gasped as she heard the swell of men shouting coming closer to her prison cell. "No… no, they're coming for me!" She cried. "So what will you do? Will you do nothing and allow your life to waste away, or will you fight it! Use your power, Elsa!" Pitch encouraged her. Elsa shut her eyes, gritting her teeth as she whimpered, ice beginning to cover the metal hand coverings and spreading further down the chain. Ice began to cover the floor, crawling up the walls until it reached the ceiling. She opened her eyes, looking all around as the ice spread. Pitch grinned, returning her unsure gaze with one of approval. "That's it, Elsa…"
The men outside pounded on the door just outside. "It won't open, it's frozen shut!" One shouted. "Break free from your bonds, Elsa. If you want to see your sister again, she awaits in the tundra." Pitch said. Elsa grunted as the metal coverings broke, clattering to the ground as she rubbed her wrists. She gasped as the guards began to pry the door open from all their force, looking around fearfully. "There's no way out!" She cried, looking up at Pitch. "So make one." Pitch smirked, looking to the door being pried open, holding up his hand so black sand swirled from it, darting towards the door, hitting it and forcing the men back on the other side, causing it to shut again. "Go on, Elsa… show me what you can do." Elsa's eyes widened from this display of power, staring at Pitch for several moments before turning to the back wall, holding up her hands and biting her lip, letting loose as a single icy burst from her hands was enough to blast a huge hole in the wall. She ran towards it, climbing out through the rubble. Pitch watched her as she made her escape, smirking as he chuckled to himself. As Elsa wandered around the frozen fjord, Pitch observed as Hans discovered her escape, going out himself to confront her. He hid himself as a great storm brewed, wind and snow blowing everywhere. "Elsa!" Hans called out through the howling wind. "You can't run from this!" The young woman turned, holding her hands up. "Just… take care of my sister!" "Your sister?! She returned from the mountain weak, and cold! She said that YOU froze her heart!" Hans shouted. "No…" Elsa breathed, shaking her head. Pitch watched silently as the scene played out. "I tried to save her but it was too late! Her skin was ice, her hair turned white!" Hans added, making Elsa's heart skip a beat. "Your sister is dead! Because of you!" Elsa swayed, overcome by shock as she exhaled shakily. "No…" She stumbled, falling to her knees, the wind dying down and any airborne snowflakes were suspended in midair. Pitch watched this with awe; indeed, this young woman had great power. She held her head in one hand, and Pitch's eyes widened when Hans approached her from behind, unsheathing his sword. Now it was his turn for his heart to skip a beat, not even knowing why as Hans was about to strike her. Something flashed in his mind then, he had no idea what it was or why, but he saw a woman with silvery blonde hair falling… falling, glass shimmering like ice all around her, her eyes wide as her hand extended, outstretched. She called out one word, one blurred word, and as quickly as the vision came it went, causing Pitch to shake his head and refocus. He gasped lightly as the young woman he saw in the mountains, presumably Anna, ran in front of Hans, solidifying into ice as he was blasted back, his sword shattering like glass. Elsa gasped, jumping to her feet. "Anna! Anna… no, please no…" She touched her sister's face, her hands shaking as her lip trembled. She burst into tears, throwing her arms around her sister in an embrace. Pitch stood, walking across the ice towards Elsa. She looked up at him tearfully, shaking her head. "She's… gone… I-"
"Shh…" Pitch took a step closer. "Only you can see me right now. Do not despair, little one. There is still a chance to help your sister, it isn't too late. But if you don't control your fear… that chance will never come." Elsa nodded, tears dripping down her face. "I'd do anything… anything to get her back…"
"Then come with me. Aid me in my task and in return, I shall assist you with yours. We both have great obstacles to overcome, Elsa. This is the last time I offer this to you. Join me, or lose Anna forever." Pitch said, extending his hand, holding a snow globe in the other. There was no way that Elsa could refuse his offer, not now. She had to save her sister at whatever cost; so without hesitation this time, she reached out, grasping his hand in hers. With a swirl of wind and snow, Kristoff, Sven and Olaf gasped as Elsa disappeared from view. Moments later, before Kristoff could even register that Elsa had vanished, he noticed, by some miracle, Anna beginning to thaw. "Anna?" He smiled, running over to hold her close. Anna caught her breath, hugging him back but she seemed confused. "Elsa… Elsa…? I… I saw her crying… I felt her hugging me… where is she…?" She glanced around, gasping as the snow and ice began to magically thaw around them. "I… I have no idea Anna, she… she vanished into thin air! One second she was there and then… she wasn't…" Kristoff exclaimed. Anna furrowed a brow, swaying a bit as suddenly a boat arose underneath their feet, finding herself on it as it came out of the water. She then heard someone groaning, noticing Kristoff moving to give him a swift beating, but Anna stopped him, smiling at him with reassurance. "Let me take care of him… and then, we need to find my sister." Anna said, marching over to Hans to give him a piece of her mind. Bumby came back to Houndsditch, the Queen standing upon his arrival. "You've retrieved the soul fragment?" She asked. Bumby gave a firm nod, holding his hand, and the small shred of light arose from it. The Queen grinned, opening up the top of the pumpkin, the insides already carved out. The soul shred floated into it, shimmering inside. "Let's wait for our friend Pitch to return, and get this started." Bumby stated. Moments after he said this, they heard another 'whoosh,' he and the Queen turning to see Pitch standing before them. "Ah, you're both here. Good." Pitch said, stepping aside to reveal a very cautious, still grief-stricken Elsa. "May I introduce Queen Elsa of Arendelle, our key to defeating Jack. Elsa, this is Doctor Bumby and the Queen of Hearts." Elsa cleared her throat, bowing her head for a moment. She was a bit intimidated by these… what were they, anyway? Creatures she never fathomed. "These are um… friends of yours, Pitch…?" Elsa asked, a bit overwhelmed by everything. "Yes. Allow me to get you up to speed. As I told you, I am going to help you control your fear, improve your quality of life. In exchange, you will help us in our cause to eliminate our enemies." Pitch said. "Yes, Elsa. Very much like yourself, we all…" He waved his hand back at Bumby and the Queen. "… have been labeled as outcasts, monsters, simply for what we are and what we do. We no longer wish to hide in the shadows, away from those who seek to keep us there. This is why I was so thrilled when your… poor dear sister came to me, seeking my assistance. I knew then exactly what you were enduring. We will help each other overcome this growing threat." Pitch encouraged. Elsa glanced over as the Queen approached, jumping a bit when her large, raw hands lifted her chin. "Ah… what a pretty face you have. I hope you have something great to offer, my dear, because your beauty alone won't save you." The Queen said, taking a step back when Pitch emitted a warning hiss at her. "I'm just trying to help her… just look at how frightened she is…" She chuckled lowly. "That…" Pitch forced a grin to ease his tension towards the Queen. "Is what I'm going to be helping her with… controlling the fear of her powers. She has great potential, and she will achieve the same as us." Bumby had remained eerily silent throughout the conversation, watching as the Queen glanced at her. "We can use her as bait… the children will see her as they would a porcelain doll… she is just as fragile too, it seems." The Queen said. "Until I see what she can do, I'm not convinced that she will endure as well as I in battle." Pitch needed to use all his willpower to not strangle the Queen. What was with her? Was everything a competition? Was she so insecure that she had to make everything about herself? He remained composed, as calm as possible. "Well then… I suppose you'll just have to see her in action then, and form your own judgment." The Queen smirked. "Indeed, I shall. And I do not care from which land she is from… around here, the only one who is to be deemed a Queen is me." She slithered over to Bumby, placing the pumpkin down on a table. "Now your highness…" Bumby finally spoke. "We should at least give the girl a chance, should we not? Obviously if her abilities were enough to impress Pitch, then she will prove to be formidable in battle." The Queen hissed lowly, rolling her eyes. "Very well, doctor. Let's get on with this." She placed both her hands on the table, on either side of the pumpkin. Elsa had watched the Queen of Hearts warily, already sensing a growing tension from her. She did not seem like someone she wanted to cross; at least without consequences. "What… what is happening?" She asked. "We are creating a new guardian who will assist us in the battle… once this is completed, and then my counseling for you shall begin." Pitch answered. "A powerful flame… I shall complete this spell now!" The Queen proclaimed, her gut lurching as she spewed out flames, her sharp, jagged teeth exposed. Pitch inhaled sharply at the display, and Elsa jumped back, her eyes wide at the spectacle. She grinned upon completion, taking a step back as they awaited some astonishing transformation. When none happened, the Queen's confused expression met Bumby's and Pitch's. "Well? Isn't something supposed to happen?" "It seems that we failed to do something correctly, but what…?" Pitch strode over, glancing inside the pumpkin. "Perhaps it is the scripture where we read from that is flawed… I did nothing wrong!" The Queen snapped. "The book is not wrong…" Pitch spoke through his teeth. Bumby leaned forward, glancing inside. "Well, the soul fragment seems to be intact… but it hasn't garnered a desired reaction… perhaps the problem is the flame that you possess is not strong enough to complete this spell, your highness." The Queen widened her eyes in anger. "You dare to undermine me?!" "Not I, your grace, but this." Bumby pointed to the pumpkin and the Queen grit her teeth, her tentacles curling with rage. "So if my flame isn't powerful enough, are you suggesting another's is? It's unfathomable, inconceivable! It isn't to be bourne!" She shouted. "If you will just allow me a moment…" Pitch stepped forward, seeking to end this outburst before things escalated. "All you need to do is use this." Pitch held out a snow globe, handing it to the Queen. "This will take you to whomever, or whatever, will produce a flame strong enough to complete the spell. If it brings you to another location, you will know that the book the directions were contained in was not at fault. But if it brings you back here, then you will be proven correct and we will go forth with a new plan." Pitch said. The Queen raised a brow at the snow globe, glancing back up at Pitch thoughtfully. "Very well. While I conduct this search, however long or short it may be, you can begin house training your new pet." She said scornfully, casting it down and she was gone in a manner of moments. Pitch growled lowly, turning back to Elsa. "Come. Let us three find a more suitable domain for us to reside. In fact, you can display your powers to us freely by assisting in any areas in need of construction." Elsa nodded, still a bit shaken by everything that was happening, but she told herself to endure it; Anna was depending on it. Merida gasped for air as she felt herself being thrown onto a hard surface; the trip through the snow globe had been mind-spinning, and the landing was rough. She groaned, stumbling a bit as she stood to her feet, glancing all around her. She gasped, her eyes widened as people wearing the same attire as the spirit who had done this to her walked the cobblestone streets, many walking right through her. Her breath hitched. "No… I… I must be in hell… I want m' family… I want my mom…" She held her head, her emotions swelling up inside her. Meanwhile, Jack, Alice and Bunnymund were just leaving Alice's place in order to find Pitch. "Alright, let's use one of these…" Jack took out a snow globe. "Now remember… we have no idea what they're planning. They could have an attack waiting for us, so we have to be on guard." Alice gave a firm nod, her vorpal blade materializing into her hand. "I have no problem with that." Just as Jack was about to cast down the snow globe, he stopped mid throw at the sound of a wailing shriek not far away. All three turned towards the sound before looking at each other. "What do y'reckon that is, mate?" Bunnymund asked. "I don't know, but it sounds like something we should be looking into!" Jack exclaimed, tucking the globe back into his pocket before the three of them made their way towards the sound. Upon nearing it, they noticed the closer they got, the more sudden fog seemed to thicken the area. "Wait!" Alice started. "What if this is a trap? Pitch could be luring us into what we think is someone in peril!" "There's only one way to find out!" Bunnymund said as he swiftly hopped from one rooftop to the next, landing down into the thick of the fog. He waved his arms to clear some away, tilting his head when he looked upon the creature curled up in a fetal position, gasping through her sobs. Jack and Alice soon joined him, glancing curiously at one another. Jack slowly approached the girl, her glowing green hue illuminating the surrounding fog. "Hey… hey, are you okay…?" When he touched the girl, she suddenly jumped to her feet, gasping as she knocked an arrow, pointing it at him. The tip seemed to glow of her essence, evaporating and disappearing into the air. Jack held his hands up as she shrieked at him, glancing at the others threateningly. "Don't come any closer!" She screamed. "Look, just… I'm not going to hurt you!" Jack exclaimed as Alice moved to stand by him, her blade drawn. "Make one move and I'll slice you to bits!" Alice shouted. "Alice, wait a second!" Jack shouted. "Everyone just calm down!" He slowly placed down his staff, holding his arms up. "Look… I'm not going to attack you. We heard you screaming, we came to see if someone needed help." "Look at what he did to me… he turned me into one of the most feared creatures of m' land! I found one of his round crystals and it brought me here! Whatever you think you're going to do to me, I won't let you! I'm going to find a way to turn back into a human and protect m' family!" Merida shouted. "Wait, who is 'he'?" When she mentioned the "round crystal," Jack blinked, looking down at his pocket. "Hang on… this round crystal… did it look like this?" He slowly took out the snow globe. Merida gasped, her grip on her bow and arrow tightening. "Yes! You must be one of them! I'll make sure I shoot this right through your black heart!" "N- No, I didn't do whatever it was that happened to you! Listen, just… why don't you tell me your name, exactly who it was that did this… we can help you!" Jack exclaimed. Merida furrowed her brows, shaking her head. "I- I don't trust you… you just want to take more of m' soul…" Her voice shook. "I'm not trying to take anything from you… I promise, okay? I'm a guardian, my name is Jack Frost. My friend Bunnymund there, he's a guardian too. We help people, protect them. Just explain to us what happened to you, and we'll try to find who did it and get you back home." Merida did not want to trust this boy, but he seemed to have far more sincerity in his voice than the ghost man did. Still holding the bow and arrow up, she spoke. "I am Merida… princess of Clan Dun'Broch. I was in the woods with my horse, Angus…" She blinked then. "That was his name… the wicked spirit that made me like this… he said he had the same name as my horse!" Alice took a step forward then, a spark or realization in her eyes. "Was he wearing a top hat and a suit? Glasses?" Merida shook her head in confusion. "I don't know what those things are…"
"She has a heavy Scottish accent…" Alice noted. "I have a feeling that she comes from a time before ours. She isn't familiar with our attire." She thought of how to rephrase the question, when Merida continued. "He was wearing clothes like some of the people walking around here… how is it that you can see me but they can't? This… this large headdress…"
Alice glanced up at that, turning to face Jack. "It had to be Bumby. His first name is Angus, it cannot be just coincidence. But what would he gain from terrorizing this girl?" She breathed. "How did he turn you into… what was it again?" Bunnymund asked. "A Banshee…! They are feared in my land, an omen of death!" Merida exclaimed. "He… he said he needed my help, that he needed my soul to… to…" She tried to remember, glancing to the side as she thought. "Wait! It was some weapon! He said he needed to make a weapon…" She exhaled shakily. "I tried to get away, I did everything I could… the last thing I remember before becoming this is feeling pain… he took my dagger, and…" Her voice trailed off. Jack's eyes widened. "A weapon… no… they're going to launch an attack, but what kind of weapon could they be making? Bunny?" He turned, but Bunnymund shook his head. "I haven't a clue." He replied. Jack turned to Merida, who had lowered her bow and arrow a bit. "Merida, the one who hurt you is trying to hurt us, too. We need your help to stop him before he makes this weapon." Merida looked between the three, exhaling sharply. "Will I… be able to get back to m' family?" "We'll try our best." Jack offered his hand. "We have other friends who may know a bit more about what's happened to you, and how to get your soul back." Merida hesitated at first, finally placing her arrow back, taking his hand. "We've got to go back and see North. He may know what Pitch and the others are planning on making." Alice and Bunny each gave a firm nod, and Jack used the snow globe to get them back to North's workshop; Merida needed their help, and she would also help them in their quest, an unexpected but beneficial find. The Queen exhaled when she finally arrived at her destination, slowly opening her eyes as she felt a gentle breeze on her face. She looked around, gritting her teeth. "That… how could I be wrong, how can there be another with a stronger flame than mine?" She said to herself, and her question was answered when she heard a sound in the distance. She gasped as she saw through the treetops, a white hot ball of flame soar into the sky, bursting like a super firework as a ring of energy rippled a few dozen yards from the impact. She stared at it in astonishment before pursing her lip. "That is indeed powerful… I must seek out its source!" Meanwhile, at the destination the Queen was headed, laughter ensued as a large, black creature chirped and emitted a growly laughter as he wrestled his best friend to the ground; a young man with short, brown hair. "Toothless, knock it off!" The young man laughed. "Come on, all this slobber is going to take forever to dry!" A young blonde, about the same age as he, laughed as she helped the boy up. "A little dragon slobber won't kill you, Hiccup." She said to him, shoving his shoulder a bit with her own. "I'm gonna go to the river to catch some fish with Stormfly. You coming?" She asked. "I'll catch up with you… I want to enjoy the nice breeze up here for a little longer with Toothless." Hiccup replied, wincing and rubbing at his shoulder. "Can you not hit me so hard?" Astrid rolled her eyes. "Come on, Hiccup… if you're going to be a good chief, you need to at least know how to take a good beating now and then." "You seem to be enjoying this more than me…" Hiccup sighed. "You know, I'm not all mighty and brass like my dad was…" Hiccup puffed his chest for a moment. "No, because you don't even try…" She poked his stomach. "Come on Astrid, can't you just be… I dunno…" Hiccup groaned. "Hiccup, how can you expect to protect this village like your dad did if you can't even handle me? How about this. You leave all the fighting up to me when we're married. You can be the diplomat." Astrid raised a brow conceitedly. "Wha- hey, who's the one who trained all these dragons in the first place and defeated our enemies? All me, thank you very much." Hiccup replied. "It took quite a bit of effort to get you on board in the beginning." "True…" Astrid smirked playfully. "But say there WERE no dragons. You and me. You know you'd lose." "Well I don't think I'd want to beat up a girl, first of all." Hiccup said, rubbing the back of his neck. "Sure… THAT'S the reason why." Astrid laughed. "Uh, what are you implying?" Hiccup furrowed a brow at her warily. "Nothing." Astrid giggled, planting a kiss on his cheek. "Look Hiccup, at least you're good at boosting everyone's morale… that and your dragon training skills will make up for your…" She patted his arm. "… lack of might and brass, as you said earlier. But it's why I love you. You're as daring as a goofball can get. It's admirable." As she walked over to Stormfly and hopped onto his back, Hiccup exhaled, irritated by her words. "Don't be out too long, chief. And don't be such a baby, you know I'm just joking!" She shouted as Stormfly took off. Toothless whined lightly, gently nudging at Hiccup's shoulder and smiling at him. He could sense Hiccup's frustration, trying to cheer him up. "Thanks, bud." Hiccup sighed. "You know, in a way you're pretty much like a chief, too. We both have a big responsibility." Toothless answered by giving a nod, closing his eyes and sitting up straighter, puffing out his chest. Hiccup laughed a bit at this. "I think you've got the stature down pat." The Queen stealthily climbed and crawled up the side of the cliff, water crashing against the rocks at the base of it below. She cursed under her breath as part of her dress hem tore, her crown bobbling on her head. "Curse this horrid, jagged landscape… I ought to cover it in my flesh as it should be… moist and soft, yes…" As she climbed the rocks, she pondered how she would carry out this task. "I must execute this just right… failure of success is not an option… now… they seem like the heroic type… and heroic types are always willing to help those in dire need… yes… lure them in like little vermin, then crush them in my clenched jaws…"
Back on the cliff, Hiccup seemed to have something on his mind. He groaned lightly, letting himself fall back so he could stare at the clouds as they rolled by. "Man… Astrid is right… how would I be able to defend Berk if I can't put up a good fight without you?" Hiccup heard something then, sitting up and glancing behind him at the same time as Toothless. The dragon perked up his ears, sniffing the air as he got to his feet, growling at something in the distance. "Hang on, let me go see what it is…" Hiccup said, striding towards the left end of the cliff, further back, and closer to mainland. When he approached the brightly colored dress lightly fluttering in the wind, he noticed it was a person; what strange clothes she wore… where did she even come from, he thought? "Hey…" He bent down on one knee to take a closer look. It appeared to be a young girl, or at least, her face was extremely youthful, with short, dark hair that fell into a bob. Hiccup could not see her hands, as they were tucked underneath her, and her tentacles were carefully concealed under her dress as well. "Hey, are you okay…?" When she didn't reply, he slowly reached out a hand towards her porcelain colored face. Just when he was inches from it, she inhaled sharply, popping her eyes open. This made Hiccup jump back in surprise, catching his breath as he held his heart. The woman looked up at him, her eyes a swirl of red and green. "Who… are you…?" She asked. There seemed to be something off about her voice; it was like two speaking at once, others whispering in babbles and murmurs. "I- I… I'm Hiccup… who are… you…?" He asked. Toothless trotted up to them, still growling lowly. "Alright Toothless, calm down… she may need our help." "Y- Yes… help… I do need… what is that… magnificent creature…?" She asked. "This is Toothless, he's my dragon." Hiccup replied. "How did you get here?" "Ah… a dragon… you know, I had a companion like that once… my dear, dear Jabberwocky… such a wonderfully hideous creature, he was… but he was destroyed… by the same girl who tried to do the same to me… oh, you would know my pain… I bet you couldn't imagine the sorrow of living a life without your faithful companion, as he even now stands by your side…" The Queen spoke somberly. "I… I'm sorry… is that how you ended up here? What land are you from…?" Hiccup asked. "Oh…" The Queen groaned. "I am weak… please, it's a… strain on my voice to speak clearly… if you would but inch a bit closer, it would be a great assistance…"
Toothless growled, grunting at Hiccup with an air of suspicion. Hiccup turned to look at him. "Look bud, I know she seems a bit… different… but I'm not just going to abandon someone who needs help…" He turned back, gulping a bit as he leaned forward a bit, tilting his head so she could speak into his ear. She chuckled lightly, lifting her head ever so slightly to whisper. "I will tell you of my land…" She whispered. "It is a land of desolation… a land that only I reign, and all fall at my feet in submissive worship. I am their Queen, and they all love me in despair. They suffer and die at my command… they squelch within my halls of humid, wriggling flesh as it spreads like a venomous disease…"
Hiccup gasped, leaning back to look at the Queen with a stunned expression, only to panic when one of her hands rose to grab him, her mouth opening abnormally wide, exposing her sharp teeth as her tentacles began to emerge from under her dress. "Toothless!" Hiccup screamed, and the dragon pounced into action. However, the Queen laughed as she slammed one of her tentacles into Toothless' side, making him roll over a couple times before shaking his head, getting back to his feet as he prepared himself to attack again. "Not a step closer, or I break his handsome little neck!" The Queen growled, one of her tentacles holding Hiccup in the air like bait. "Ah… like a naïve little fish lured into the clutches of the angler, so eager to come upon its little light… going right into the embrace of death…"
Toothless stood his ground, growling threateningly at the Queen but glancing at Hiccup worriedly. "What… what do you want…?" Hiccup strained to say. "Give me your dragon's flame… and I shall be merciful and allow both of you to live… if you refuse… I shall take it forcefully and you shall die by what method I choose for you. Your dragon shall mourn for its master as I mourn still for my Jabberwocky…"
"Toothless… go… warn the others… you have to save yourse-" Hiccup was cut off when the Queen's tentacle wrapped tighter around his throat, strangling him. Toothless cried out in anguish, his eyes widening with fear for his friend, helpless to stop it. "Your time is running out, dear boy… and with it, your life as well…" The Queen said, taking out the pumpkin with the soul fragment still shimmering inside it. "This is your last chance, allow me to take his flame, or I will squeeze the life from you!" Toothless whined, hopping around on his feet anxiously. His gaze met Hiccups as she temporarily loosened her grip enough to allow him to breathe, gasping for air. "Toothless, I… I can't just let her-" He was cut off by the dragon whining again, giving him a nod. Hiccup shut his eyes tightly, giving a nod, as best as he could in his position. "What a good boy… see how everything works out when others cooperate with me?" She threw her head back in laughter, using one hand to hold the pumpkin, and then the other to grasp the stem, opening up the pre-cut lid. When she did so, the soul fragment's glow pulsed for a moment, before the air began to be sucked into it. Toothless tried to anchor himself, but the power from the spell brought him closer, the force of the winds picking up as the Queen grinned wickedly. Toothless' typical violet glow began to appear from within his clenched teeth, groaning as he shut his eyes tight. He finally gave in, his mouth being forced open from the wind's power as a stream of white hot violent shot out of his mouth and into the pumpkin, crying out in pain. His wings rippled violently from the winds, like a huge vacuum sucking everything in. Finally, the winds stopped when the Queen placed the lid back on, her tentacle tossing Hiccup aside. Despite the rough landing, Hiccup scrambled to his feet as he saw Toothless swaying, nearly passing out. "NO! Toothless, come on!" He swiftly hopped onto his back. "Come on bud, we can't let her get away!" The Queen grinned, holding the pumpkin to her chest as she dove off the cliff, taking a snow globe and casting it, the portal opening up in midair as she entered it. Toothless shook his head, trying to focus as his vision blurred, taking a dive off the cliff as well in pursuit of the Queen. Hiccup's eyes widened upon seeing the portal, and Toothless cried out in surprise as they entered it, disappearing from Berk without a trace. Merida blinked as she arrived with the group just outside North's workshop, her eyes widening as she gazed at its splendor. "What… what is that?" She asked. "This is where my friend North lives, he's one of the guardians I told you about on the way here. Come on, let's head inside." Jack said. "Oi, I will NEVER get used to these frigid temperatures!" Bunnymund said as he rubbed his arms, hopping inside as quickly as possible. North turned at the sound of the group entering, smiling lightly. "Welcome back, my friends! What news do you bring? Have you thwarted Pitch?" "Not exactly… but we do have some new information that may prove valuable… we just need your help in determining what it might mean." Alice answered. "What have you learned?" North asked curiously. "I think I should let her tell you…" Alice said, stepping aside to reveal Merida. She was distracted, looking all around the workshop, totally fascinated. She shook her head when Alice gently nudged her, turning to face North. "Young lady, what might your name be?" North was a bit unsettled by her appearance, but if she was a friend and not a foe, he would accept her. "I am Merida… Jack Frost… that lad there…" She pointed at Jack. "… he told me you could help me change back into a human." Jack stepped forward. "One of Pitch's allies… the doctor… apparently used one of your snow globes to get to Merida… he took a piece of her soul and left her to die, and she turned into… into a-"
"A Banshee…" Toothiana spoke for the first time, Sandy helping her forward. "A Banshee is… something between a spirit type and a fairy… oh, but humans are terrified of them. They are the bringers and messengers of death, so they are usually avoided by people. How they are created is… it's a terrible thing to go through… so tragic. Whomever it was that turned her into one must have killed her." Merida stepped back, her brows furrowing as she shook her head. "Killed? So I-… I'm dead?! I'll never see m' family, or-"
"Hush now, Merida." North said, trying to comfort the girl as she emitted a loud wail, and everyone covered their ears. "Oh, that's the other thing with them…!" Tooth shouted over the screaming. "They tend to be quite loud!" Merida's screaming finally calmed, sobbing into her hands. Bunny went over to her, feeling sorry for the poor girl. "Hey, Sheila. You're a strong warrior. No one can bring someone down like you so easily. We'll figure something out and get you back home to your clan." The girl glanced up at Bunny, her eyes burning into his for a moment. But his gentle smile brought one to her own features, a small one as she wiped away her tears. "She told us that Bumby claimed a part of her soul in order to create some kind of weapon. She doesn't know any other details, but Jack thought that you may know of what our enemies are planning from that bit of information; an educated guess at the very least." Alice said. Jack stepped forward, placing the sacred book into North's hands. "We found this… Pitch and the others used this as a cover to elude us. It seems they got what they needed from it already." North furrowed his brows in deep thought as he opened the book, flipping through the pages to see if he could match the information given to him with something. When he stopped on one page, realization hitting him, he gasped lightly as he slammed the book closed. "No… it cannot be…" He breathed. "What? What can't be? North?" Jack spoke, taking a step closer to him. "Many ages ago, there was once an ally of ours... if you could call him that… who used to terrorize the children of Earth at the end of each harvest season. They were traumatized; he was almost as bad, if not worse, than Pitch! Despite him doing this one day of the year, we were forced to deal with him properly… we were able to destroy him, but the instructions of how to recreate him are in this book!" North exclaimed. Sandy crossed his arms at North's words, showing dislike for this mysterious individual; describing him by trying to make a scary face, holding his hands up in a pretend fashion and stomping around on the air, as if to intimidate a monster. "His name was Wick. 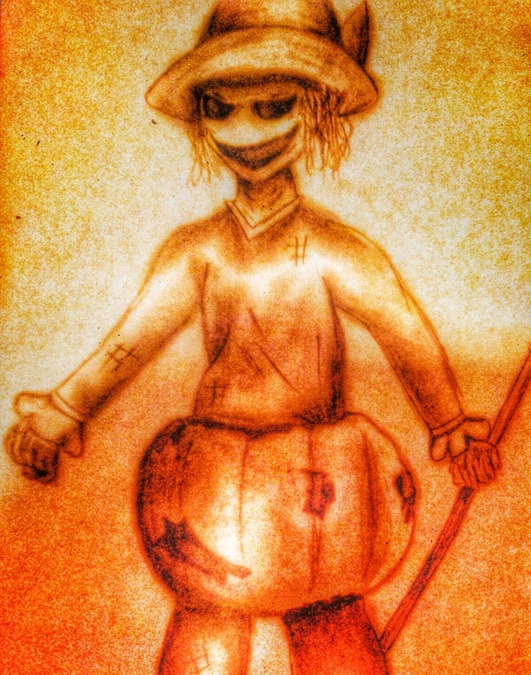 The day he would terrify young children, he called it Hallows Day…" Toothiana commented. "Hey, how come you guys know all this stuff and I don't?" Bunnymund asked. "Because we actually read, you silly." She giggled. Bunnymund rolled his eyes playfully at that. "How's the wing holding up there, Tooth?" "Oh, still healing, but much better, thanks." She smiled lightly. Jack smiled, him and Bunnymund talking to her and Sandy, Merida going over towards them curiously. Alice glanced back at them for a moment before approaching North. "North, is it?" She asked, and he gave a nod, smiling lightly. "Just… what exactly are we dealing with here? With this… new creation?" "Well… from what I know of Wick… he is as unpredictable as he is dangerous. He induces fright in children, but in a different way than Pitch does." North responded. Alice nodded a bit. "What else is needed to create him?" "Well… once a soul shard is collected; a powerful flame must ignite it. No man made flame can sustain it." He replied. Alice widened her eyes then. "The Queen…" She breathed. "Her flame is quite powerful, as I recall…"
North placed a gentle hand on her shoulder. "It is late. You must regain your energy and have full focus. You may continue your search in the morning. It is important that you face our foes at full capacity." Alice glanced up at North. "You know not of the foulness and corruption that my enemies harbor. This is simply not your war anymore; the burden also falls onto my shoulders. That vile creature who calls himself a doctor is the murderer of my family… and worse. I cannot rest until they are destroyed." North frowned lightly. "I do remember you, Alice. You were very young when your mind's eye was blinded… but it was opened again. I still do not understand how you still have it, how you were able to see again." "Because I rid myself of that which afflicted me. And I must do the same for this world before they do the same to others." Alice replied. "After a short rest now, young lady. Though it is critical that we stop this threat as soon as possible… I can see that you are all weary. You have all protected us, and so this shall be your sanctuary." North said. "I have no sanctuary. For wherever I go, my memories always follow. They always haunt me… you all have something to fight for, I lack that. My family is lost forever because I was powerless at the time to thwart my enemies." She sighed then. "I apologize… I carry a heavy weight on my shoulders. I appreciate your sentiment. I know you mean well." North watched as Alice joined the others, all of them speaking and getting to know each other, sharing a bit of lightheartedness for the first time since this whole ordeal began. Night soon fell, and they were all accommodated for to stay until morning where their journey would continue. Merida agreed to assist them however she could. "If we can get that soul fragment of yours back… then there is still a chance for you to become a human again. Because the doctor took it out of you before… you know…" Toothiana frowned lightly. "… that part of your soul wasn't present…"
Merida smiled hopefully. "I'll be able to see m' mom and da again? My brothers?" Toothiana smiled lightly, nodding. "Yes. You've been through a lot today, so make yourself comfortable." North glanced around, going over to Sandy when no one was around. "Sandy… I need you to keep an eye on Alice. I am afraid that she may sneak off by herself in the night… if she tries to leave, knock her out." Sandy nodded, pounding his fist into his other hand. North rolled his eyes. "Your sand…?" Sandy blinked before nodding in understanding, gesturing a goodnight to North before going to his resting area. Jack slowly closed his eyes, curling up under his bed sheets. As he fell into slumber, he began to hear a familiar voice in his dreams. "Jack? Jack!" The voice cried from a distance. "Emma!" Jack called back in his dream, looking around, but all he could see was darkness. "Emma, where are you?" "Jack..." The voice was not shouting as much now, speaking barely above a whisper. "I'm scared..."
Jack looked down, ice spreading and cracking under his feet. He noticed a single crack spreading farther away from the others; as he followed it, he could hear Emma's frightened whimpers echoing. "Emma, tell me where you are! I won't let anything hurt you!" Jack gasped lightly as he heard the low rumble of dark chuckling, sprinting faster. He then saw a pair of glowing eyes in the distance, glaring angrily. "Leave her alone, Pitch!" The eyes then disappeared in a whisk of shadows, leaving Jack searching again. "Where is she, Pitch? Where is-"
"-my sister!" A voice shouted. Jack exhaled as he slowly turned, seeing Alice was parallel to him as she shouted. He gasped when a monstrous form of Bumby loomed over both of them, stumbling and nearly losing his balance as he stared in horror. She did not seem to acknowledge his presence. "They are dead..." The monster spoke, his voice distorted. "And you should be too..."
"You misbegotten abomination... murderer! You blood sucking parasite! The damage you've done to children... the abuse!" Alice screamed. "You're lost... and where your body is, your mind will follow... perhaps... it is already there..." The distorted voice deepened, and Jack gasped when the ice caved underneath him, falling into an endless abyss. From the top of the hole, he could hear Emma crying out for him, her voice fading. As Jack fell, light erupted from underneath him, flames growing up towards him as he fell. Just as he was about to reach them, he gasped awake from the nightmare, holding his chest as he sat up straight. He gripped the top of the mattress to help him up, turning his head to jump a bit in surprise, falling over again when Alice standing on the other side of the bed startled him. "Well, someone is quite jumpy…" Alice commented, walking over to where Jack was, holding out her hand to help him up. "Thanks…" He said quietly, sitting on the edge of the bed as he held his head in his hands. "You were dreaming of her again, weren't you? Your sister…" Alice stated. Jack sighed, nodding lightly as he closed his eyes for a moment. "I don't understand… I protected her from falling into the ice… why am I having these nightmares…?" Alice wore a serious expression, observing Jack as she stood in front of him. The moonlight from the window illuminated one side of her body, while the other was consumed by the darkness of the room. "Just because you sacrificed yourself to eliminate one evil does not mean that she is invulnerable to another." Alice said. "Not to be pessimistic… but your dreams may be telling you something. Dreams can be like riddles… the answer can be hidden in plain sight, you just have to decipher it." Jack nodded in understanding, finally lifting his head to look at her. "Did I wake you?" "Not at all. I haven't slept a wink. Who could with so much on their mind? Well, more than the usual for me, that is. We can't stay here, Jack. There are things we need to do." Alice said. "North really wants us to stay here, and I don't feel like arguing with him-"
"He does not understand the malevolence of my enemies and the destructive effects that will come from our failure to stop them. The more time we spend here, the more time they have to prepare. We haven't another minute to waste. Go fetch Merida, I shall fetch Bunnymund. I'll ask North for forgiveness if we have the chance, but tonight we'll have to take a rain check." She turned, walking out of the room as she headed for Bunnymund's resting area. She called his name quietly a few times, garnering no response. She rolled her eyes, reaching over with her thumb and index finger to pluck a hair from his eyebrow. His hands smacked against his face in reaction, hissing from the sting as he was jostled awake. "Oi! Alice?! What the bloody hell woman?" Bunnymund exclaimed, and Alice quickly shushed him. "Are you barking mad?" She hissed in a whisper. "You'll awaken the dead by being so noisy!" "I'm beggin' your pardon, but I take offense to that." Merida said, crossing her arms as she floated into the room, Jack following just behind her. Alice rolled her eyes at Merida before turning her attentions back to Bunnymund. "We need to go. If this new guardian our enemies are creating is as dangerous as North made it out to be, then we need to stop them, now." "The only thing I'm doing, is going back to sleep and pretending THIS…" He pointed to the hair Alice was holding. "… did not happen." Alice narrowed her eyes, grabbing at Bunny's chest hair and yanking him up. "Our foes are NOT resting. And because that is the case, neither should we. Now, if you are the great 'guardian' you say you are, you will heave your tail end out of this bed and do what must be done. Understand?" "Okay, you know what? Who do you think you are, coming in here, telling ME what to do? You think you can parade yourself around here because you're all tough!" Bunnymund exclaimed. "I don't 'parade' myself. I simply do what needs to be done; I just don't stand around and wait for imminent peril to meet us at our doorstep." Alice replied. "What do you care about all this, huh? Got some grudge against those nutcases, so what? What you're in this for, has nothing to do with what WE'RE in this for. We are in this, Jack and I, to protect the children of the Earth, what we do is something you just don't understand!" Bunnymund shouted. "Oh, I don't understand about playing hide and go seek and coloring eggs? Oh my, what a toil your life is." Alice said sarcastically, turning to head out of the room. Bunnymund fumed then. "That is it! I don't care what you've been through, you do NOT insult what I do!" "Then stop making excuses! If you have something important to fight for, as you say, then get up and fight for it!" Alice responded. "At least I have something to fight for! You don't have anything, you don't have friends, you don't even have a family!" Bunnymund snapped, but instantly regretted what he said the moment he saw Alice's stone hard expression twist into one of pain, trembling lightly. "What the hell, Bunny?" Jack exclaimed. "Do you have any idea how-"
"No." Alice said, inhaling sharply and furrowing her brows angrily as she stood a bit straighter. "The rabbit is right. I have always carried my burdens alone, and I won't act to change that now." "Alice, come- Alice!" Jack shouted as Alice stormed past them, stopping only to blink in awe as Alice burst into a cluster of blue butterflies, soaring through the air to exit the workshop. He saw her rematerialize into herself on the roof, floating down before running off through the snow. "Why did you say those things to her?" Merida glanced at Bunnymund, furrowing a brow. "Aren't you supposed to be some kind of team?" "We WERE." Jack said angrily, glaring at Bunnymund. "Anything happens to her, it's on you." He said before floating up to go after her, Merida glancing back at Bunnymund before following Jack. Hiccup groaned, blinking his eyes a bit as he felt the light pitter patter of raindrops against his face. He felt a light nudging at his side, glancing over to see Toothless, who whined at him lightly. "Ugh… Toothless…? What happened…?" Hiccup groaned as he sat up, brushing the hair out his face before carefully getting to his feet. He glanced around, furrowing his brow as he took in the new, unfamiliar landscape. He stood on a cobblestone road; dim lamp stands barely illuminating the area, small shops and housing complexes lining the streets, a few tunnels or bridges seen every now and then. "Where are we…?" He gasped when he thought he heard footsteps, looking around quickly before spotting an alleyway. "Come on, bud… we have no idea what's around here." As Hiccup ushered Toothless into the alleyway, who trotted with his ears pinned back, a cluster of blue butterflies appeared not far from where he had been standing. Alice materialized from them, her eyes closed for a moment as she exhaled sharply. She opened her eyes, glancing around a bit. When she spotted no one around, she began to cry lightly. Wiping tears from her eyes a few moments later, she stood a bit straighter, striding down the dimly lit street. Thunder roared in the distance as she walked, passing an alleyway. Her footsteps slowed to a stop, and Hiccup watched tensely with Toothless as they saw the girl stand still at the end of the dark alley. Alice did not turn to look down it straight on right away; all she knew was that she had spotted a pair of large, inhuman eyes at its very end, the dim street lamps barely making a reflection, but she had caught it nonetheless. Toothless growled lowly in the shadows, Hiccup quietly shushing him. Alice turned her head slightly, her dampening hair fluttering in her face a bit as she glanced down the dark alley. She slowly turned to face them as her vorpal blade appeared in her hand, narrowing her eyes. "Whatever you are… show yourself now. I know you're there. And if you think I'm some damsel in distress, you're gravely mistaken." Alice called out. Hiccup glanced at Toothless in the shadows, standing up from his crouching position slowly. "We're not going to attack unless you're going to try to hurt us again." Alice tilted her head; the voice sounded normal enough… but she kept her guard up nonetheless. "Again? Do I know you? You don't sound familiar. Show yourself." Hiccup walked into the dim light, and Alice was a bit surprised to see that this was just an average looking young man. "Who are you? And what creature accompanies you?" "My name is Hiccup. I… don't exactly know where I am, but… we're after someone who tried to hurt us… they made some kind of… some kind of opening, in the air, and we came here when Toothless and I flew into it." "Toothless… is that the name of your creature?" Alice asked. "Yeah… and he's a dragon, by the way." Hiccup corrected. Alice grimaced. "I'm not particularly fond of things that breathe fire. Those I have encountered have not made the most pleasant of experiences." "I guess you're in luck then… whoever it was that attacked us in the first place… she did something to him. She took his flame from him… she said she needed his flame for… something." Hiccup said. Alice's eyes widened for a moment then. "Flame… what did this fiend look like?" Hiccup thought for a moment. "Well, she… wore this large… outfit. She seemed just… she was weird at first, but then… I don't think she's human. She was like some sort of squid… she had sharp teeth, and she-"
"No…" Alice breathed, glancing up at Hiccup. "I'm afraid you've run into a very old but persistent enemy of mine… I'm sorry to say… Hiccup… but you've fallen into the middle of a rather large mess. She plans to use your dragon's flame along with her equally as despicable contemporaries in creating a weapon to cause havoc." "Look, uh… sorry, I didn't get your name." Hiccup started. "Alice Liddell is my name." She replied. "Right, uh… Alice. I need to get back home… you see, I'm the chief of Berk, and they all need me to-"
"And I'm a world renowned starlet. We all have things we need to get back to or accomplish but that must be put on hold until this threat is alleviated." Alice replied. Before she could say anymore, she heard her name being called, thunder roaring once more as she turned to see Jack, Merida and Bunnymund heading in her direction. "Uh…" Hiccup pointed from Alice to the group approaching, staring oddly at Bunnymund and Merida. "Explanation, please?" "Excuse me." Alice said, pointing at Toothless who was emerging from the alleyway, growling lowly at the others. "I don't think you're one to talk from bewilderment." She then walked up to Jack, sighing lightly. "Why did you follow me?" "Alice, I'm not going to let you go out here by yourself!" Jack glanced over at Toothless then, raising a brow and nodding his head towards the black scaled dragon. "Who's this?" "Our newest victim of the Queen's tyranny. It seems that my intuition rules the day along with her; she has stolen the flame from this creature, presumably to-"
"- make the guardian…!" Jack groaned, cursing under his breath. "Did you see any sign of her?" "Toothless and I chased her here, the… Queen? She was more like some giant… deadly… creepy… squid or something, hardly a queen…" Hiccup replied. "But I didn't see her after we came here; it was a bit of a rough landing." They all introduced themselves, Alice avoiding even looking at Bunnymund. "Look Alice, I know you want to go after Pitch and the others, I do too. But we need to at least make a plan first, okay? If we just go in without a plan we'll be in big trouble." Jack said. Alice looked over at him. "Well, at least you're willing to compromise… I suppose we should remove Hiccup and his dragon from the streets, dawn should be arriving in a few short hours and I doubt the people of London will appreciate Toothless wandering aimlessly around here… or they'll at least think they've gone madder than I." "Well, I appreciate that, er, Alice… and while we're taking a nice little stroll, how about you talk to me about how in the name of Odin I am seeing a walking, talking rabbit taller than ME and uh… whatever she is." He said, pointing at Merida. "M' name is Merida!" She shouted at Hiccup, making him wince. "And for your information, I am a first born princess and very experienced in archery! I've been turned into a Banshee, at least you've still got your warm blood!" She frowned. "Banshee…? That's what my family and friends on Berk used to call dragons… you just look like a… ghost or something." Hiccup replied. "Mind telling me what the difference is?" As the others talked a bit, Jack walked alongside Alice, who he noticed was staying quiet. "Hey… are you okay?" He asked. Alice looked over at him, sighing. "I'm never okay, Jack."